Let’s take a look at one of the horses from the Todd Pletcher stable – Capo Bastone. Capo Bastone comes from Street Boss, a multiple graded stakes winner that captured third place in the Sentient Flight Group Breeders’ Cup Sprint in 2008. Street Boss was known as only a talented runner at six furlongs but having come from the lineage of Street Cry, shares some all-round talented bloodlines with a pair of impressive horses – Zenyatta, a former Horse of the Year winner and Street Sense, who won the 2007 Kentucky Derby. Capo’s big win this season came at Gulfstream on what was a sloppy track. Pletcher was happy with Capo’s performance on the 1 1/16-mile track, even though he recognized the time was slow and it wasn’t the most impressive field of all time. “It was probably more impressive than the final margin of victory or final time suggests,” Pletcher told Daily Racing Form. “He broke cleanly and it kind of put him in a difficult position because he was all of six wide all the way around the first turn, put in a nice run down the backside to put himself in a good position, and he’s the kind of horse who waits on his competition. Needs no real introduction, does he? Well, let’s do one anyway. Arguably the finest trainer in horseracing today, Pletcher has won four Eclipse Awards as outstanding trainer of the year. In terms of the Triple Crown, few trainers are more decorated. Pletcher won the 2010 Kentucky Derby on the strength of Super Saver, which just so happened to be his first horse entered in the Run for the Roses (he’s gone on to run 23 more at Churchill Downs). 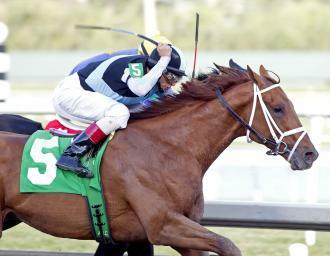 He also captured the 2007 Belmont Stakes with his prized filly, Rags to Riches. Capo Bastone is just one of the numerous horses Pletcher will be behind as the 2013 Derby Draws near. The “face” of ETP is President Aron Wellman, a longtime horse enthusiast who was born with a love of the sport, counting Bill Shoemaker and Eddie Delahoussay as close family friends during his childhood. What’s a Capo Bastone, anyway? If you don’t know, you clearly didn’t watch enough Sopranos. A ‘capo bastone’ refers to an underboss, a position within the leadership structure of mafia crime families. Think of Paulie Walnuts. He was a Capo Bastone. — Pletcher on Capo Bastone, to Brisnet.